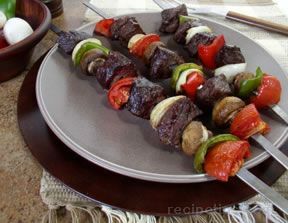 Great flavorful kabobs with a nice mixture of grilled beef and vegetables. 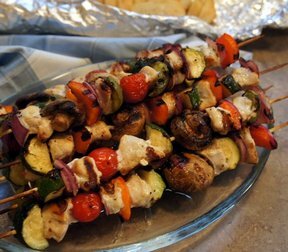 These kabobs would make a nice addition to your 4th of July or other summer celebrations. In saucepan over high heat, combine the rice & water; bring to boil. Reduce the heat to low, cover & simmer until the water is absorbed & rice is tender. Cut the meat into 4 equal portions and add Italian dressing over the top. Chill for at least 20 minutes to marinate, turning as needed. Prepare hot fire in grill or broiler. Thread the meat, pepper slices, cherry tomatoes & onion wedges onto each skewer, alternating meat and vegetables. Place kabobs on grill rack or broiler pan. Grill for 5-10 minutes, turning as needed. Divide the rice onto individual plates; top with 2 kabobs & serve. Serves 2. 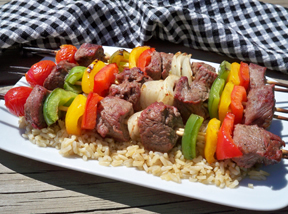 "These kabobs were great and best of all they were easy! We will be having them again soon."